Awnings and enclosures may not be top-of-mind when you think about exterior signage, but few investments in your business have such an obvious pay-back period. Particularly in the New England climate, exterior structures can pay off quickly, thanks to extending your hours into the evening, adding additional seating, and keeping your customers happy and comfortable, protected from the elements. 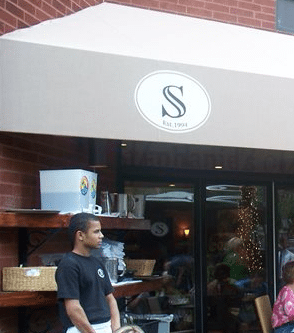 Custom-designed, high-quality awnings provide additional patio seating for restaurants and encourage patrons to stay a little longer and order another latte at a coffee shop. Awnings and canopy signs add architectural interest to many stand-alone businesses, and often are used to create a more inviting entry to hotels and corporate offices. In retail developments where signs are required to be placed on standard awning or canopy signs, making sure your brand and logo are properly represented can be tricky. Our experienced fabricators and designers have worked with countless store owners and developers, as well as with their architectural design teams, to ensure everyone – developers, owners, and zoning boards – are pleased with the result. And above all, Metro’s team works hard to make sure that the signage and awning, canopy or enclosure really POPS – bringing in customers, building your brand and image. The key to long-lasting, great-looking canopies and awnings is getting the right shape, material, and design for your project, then using experienced fabricators to provide quality construction. If you’re ready to heat up summer sales with a new awning enclosure, get in touch. Just thinking about the possibilities? Browse our portfolio or call us to discuss your ideas. 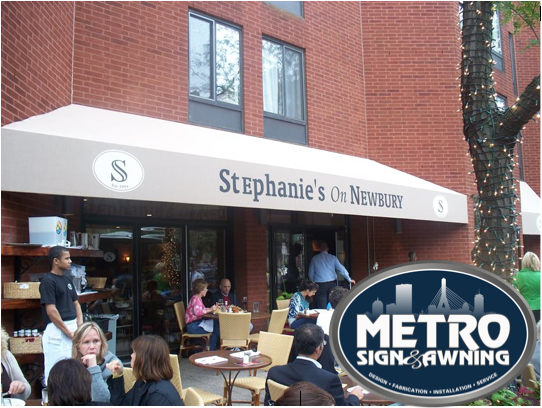 We love to help Boston-area businesses discover what great signs (and awnings, and canopies) can do for their bottom line!